Please note that the content of this book primarily consists of articles available from Wikipedia or other free sources online. John William Patrick Smith (born 7 March 1951) is a Welsh Labour Party politician who was the Member of Parliament (MP) for the Vale of Glamorgan from 1997 to 2010. 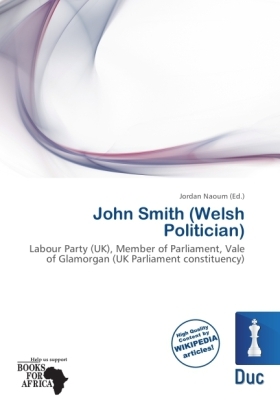 Born in Penarth, Smith attended Fairfield County Primary School in Penarth then Penarth County Grammar School (which became the comprehensive Stanwell School in 1973) on Archer Road. He served for a while in the Royal Air Force, then worked as a carpenter and joiner for Vale Borough Council from 1971-6. He became a mature student in 1976, studying at the Gwent College of Higher Education, then went to University College of Wales, Cardiff where he gained a BSc in Economics in 1981. He was then a university tutor until 1985. From 1985-9, he was a senior lecturer in Business Studies. He became a campaign manager for Gwent Image Partnership, becoming chief executive from 1992 after he lost his seat.